Usually, I'd describe my skin as combination/oily, with dehydrated tendencies. However, when this time of years rolls around, with the cold, blustery weather and deadly central heating, it transforms into being much more dry in areas and oil is less of a problem. There is nothing worse than patchy, scaly skin that becomes just so obvious when makeup is put over it. Exfoliation is key. 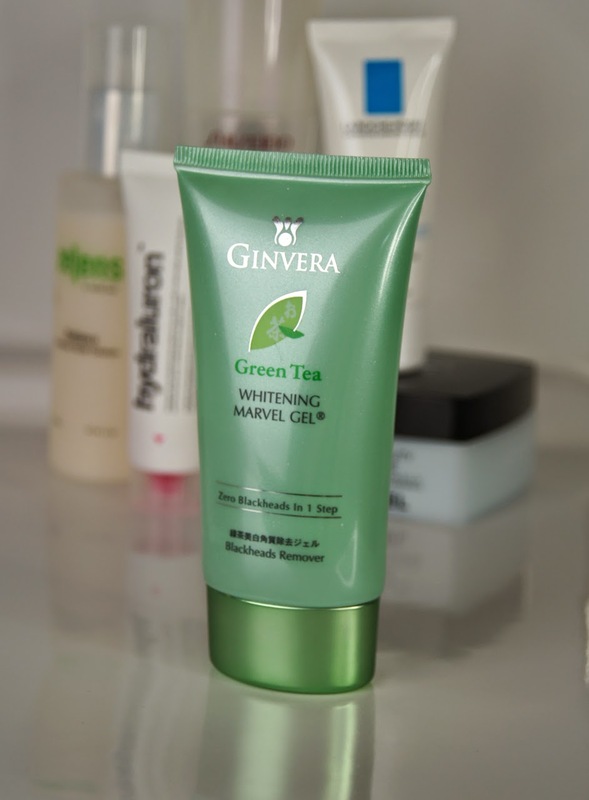 When I just want a quick, gentle exfoliation, then I choose this little wonder, the Ginvera Green Tea Whitening Marvel Gel. I've had this ever since it suddenly burst onto the scene, so I've had plenty of time to give it a good going over. It both looks and feels like lime jelly, but is more watery than solid in texture. It smells fresh and isn't too strong at all. Onto dry skin, you apply roughly a fingertips worth of the gel to the whole face, concentrating it on the areas that are the most dry and where you suffer most from blackheads. As you rub in small, circular motions, the gel seems to melt away and you are left with little balls of product. The more you rub, the more that these will appear. This is, in fact, small balls of dead skin that have been exfoliated off your face (not the most pleasant of facts, sorry if you are squeamish!). I do hope that this is true and not just a gimmick, but I'd never know and it still exfoliates well, so I'm not too bothered. When you feel that your face has had enough, you simply rinse and are good to go. It couldn't be simpler! But, does it stand up to the numerous claims? From my experience of using it, some of them, yes, but not all. The gel does effectively exfoliate the face, rubbing away dead skin cells effortlessly. With continued use, blackheads do seem to be diminished, but only when used regularly. When missed out of your routine for a few days, they soon reappear. I didn't notice a change in my pores, but I don't have any major problems with pores to begin with. The claims that this product lightens or whitens skin, I've found to be completely untrue. Although, as it removes dead skin cells, it will brighten the complexion, it doesn't have a bleaching effect on the skin, so this could be slightly misleading for some people. I haven't noticed that it helps with oil control either, but it will help with blemishes, seeing as any dead skin that could block your pores and lead to breakouts, will be cleared. Products used after exfoliation will always sink into skin more quickly, no matter what exfoliator you use, so that isn't anything new. I do think this is a great product, especially as it's so gentle on the skin, but effective at the same time and can be used everyday if you wanted. However, I wouldn't recommend this for people who suffer very badly with dry skin, as I just don't think it would be quite effective enough. I think £22 for 60ml is a fair price for this exfoliator and a tube will last a long time, if you use only a fingertips worth per application, which is plenty! The packaging isn't the most special, but it's perfect for the product, light and allows you to use up every last bit of the gel. 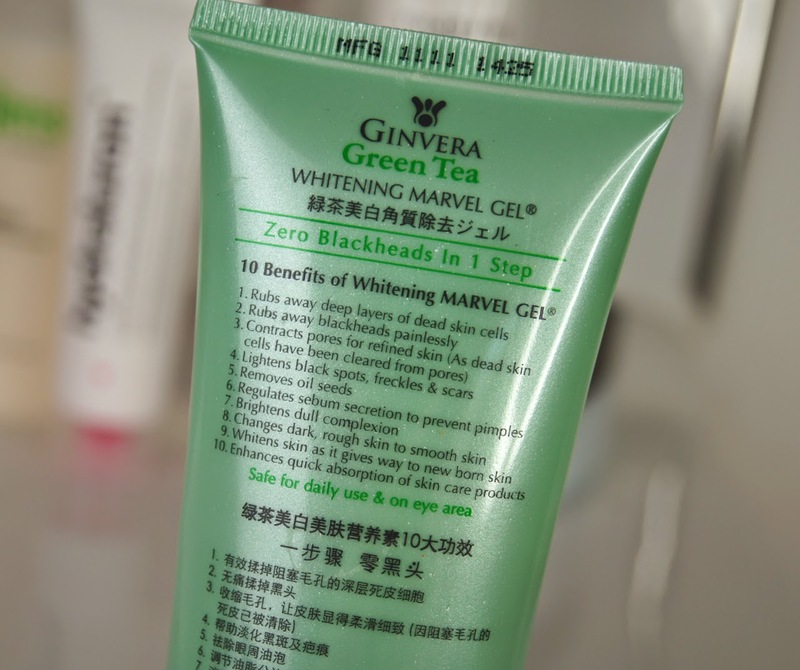 Have you tried the Ginvera Whitening Marvel Gel? Did it work for you, or not?